Sandile Bhengu comes from Durban, South Africa, where he in the middle of the 90’s released his debut kwaito album Amajovi Jovi under the moniker Sandy B. During the following decades he would move actively within the local music scene and touch a variety of genres including afro-pop, deep house, R’n’B and Soul. In the mid 2010’s around 20 years since its release crate diggers and DJ’s across Europe and North America started dropping tracks from Amajovi Jovi. In late 2017 the album was reissued on Canadian label, Invisible City Editions giving a new lease of life to a forgotten classic and giving this once little known artist an international reputation. 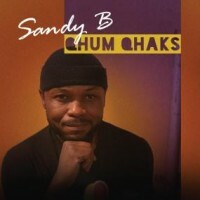 Following the successful re-issue of the 1995-album Sandy B returns to the forefront of music with original material 24 years later in the form of Qhum Qhaks. Qhum Qhaks comes from a close collaboration between Sandy and Danish DJ and collector Simon Lundsgaard a.k.a Simone Ahà. All songs were recorded in Sandy’s home studio to stick close to the ethics and production techniques of the 1995 classic. The material that emerged from this experimental process between the two of them captures the spirit of old school kwaito from the 90’s. Vumbuka Records was founded by Sandile Bhengu & Simon Lundsgaard in 2019 especially for the release of Qhum Qhaks. The vinyl release of Qhum Qhaks contains seven original tracks and a download code with three extra bonus tracks.